“Do You Believe in Magic?”-After 4 continents, 9 countries, and over 35,000 miles Father/Son team David and Connor O'Leary arrive first to the finish line and are awarded the 1 million dollar prize, on the season finale of the All-Star edition of THE AMAZING RACE on the CBS Television Network. Pictured L-R: Host Phil Keoghan, David O'Leary, Connor O'Leary Photo: Sonja Flemming/CBS ©2013 CBS Broadcasting, Inc.
Utah has long produced a variety of reality show contestants. We’ve seen David Archuleta, Julianne Hough and Carmen Rasmusen sing and dance their way to fame on American Idol and Dancing With the Stars. But Utah has also been well represented in shows requiring physical fitness and endurance – especially in the past several months. The latest Utah products to capture fame and a certain amount of fortune on a reality show are the father-son tandem of David and Connor O’Leary. After an injury-shortened run on The Amazing Race in 2012, the Salt Lake City residents capped a dominating shot at redemption on the recently-completed Amazing Race All-Stars competition by winning six of the competition’s 12 legs. Connor, a former professional cyclist for the Bontrager-Livestrong team, joined his father, a real estate developer, were invited back after an Achilles tendon injury shortened what appeared to be a run at victory two years earlier. This time, the father and son duo didn’t let anything stand in their way as they traveled the globe for challenges and became fan favorites in the process. “I’m proud of my son. I can think of anything better than to win The Amazing Race with my best friend,” David O’Leary said while choking up with emotion during the series finale. Making the victory and the million dollar prize more sweet is the fact that both O’Learys are cancer survivors. David O’Leary survived a bout with prostate cancer several years ago while Connor beat testicular cancer as a teenager. David, 59, is the oldest to ever win the show, Connor is the youngest at 22. They are also the first parent-child combo to win CBS televsion’s The Amazing Race. 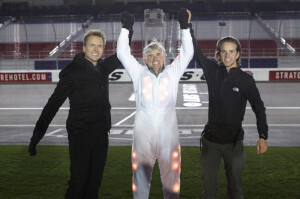 Utahn's Connor and David O'Leary won CBS's the Amazing Race this spring. 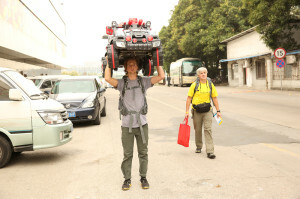 “Baby Bear's Soup” –In this Road Block, Father/son team Connor (left) and David (right) must assemble a toy car and then deliver it to the Guangzhou Children's Cultural Center in order to receive the next clue, on the All-Star edition of THE AMAZING RACE. Photo: Robert Voets/CBS ©2013 CBS Broadcasting, Inc.
Connor’s name should be familiar to Utah cycling fans. As a member of the Bontrager-Livestrong team and part of the USA Cycling development program, O’Leary raced against the world’s best in Europe, North America and in many other places – a fact that may have come in handy during the globe-trotting Amazing Race competition. For a couple of stages, O’Leary wore the best young rider or best Utah rider jersey in the Larry H. Miller Tour of Utah. His membership on the Livestrong team resulted in numerous articles highlighting his recovery from cancer back to the professional peloton. Following his win, Connor O’Leary said he intended to donate a portion of his winnings to cancer research, travel the world under a little bit less stressful circumstances and then figure things out later on. Though not currently an active cyclist – the television show occupied much of his ability to train and compete – O’Leary hasn’t left the cycling world behind. He’ll be involved with the Tour of Utah again this year working behind the scenes. The O’Learys aren’t the only Utahns to take advantage of cycling fitness to win. Utah’s Tyson Apostle, a former pro racing domestically and in Europe, has been a frequent competitor on CBS’s Survivor series and won his own million dollar prize a few months ago when he outwitted, outplayed and outlasted the rest of the field in Survivor Blood vs. Water.